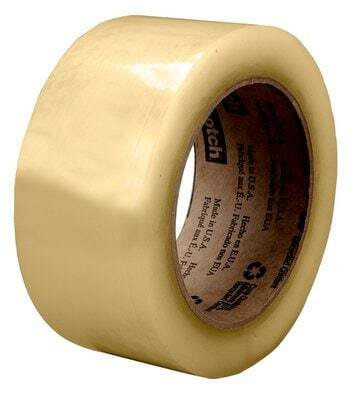 Scotch® Recycled Corrugate Box Sealing Tape 3071 is an industrial polypropylene packaging tape designed with a proprietary synthetic rubber adhesive capable of bonding many surfaces instantly, specifically recycled corrugate and fiberboard. We constructed this tough corrugate tape to meet the demands of challenging packaging applications and maintain resilience from production line to delivery. Scotch® Recycled Corrugate Box Sealing Tape 3071 is a 2.1 mil (53 micron) polypropylene packaging tape that quickly and securely sticks to a wide variety of substrates, including recycled corrugate and fiberboard. The average corrugated box consists of 46% recycled content and that number can fluctuate with every box delivery. 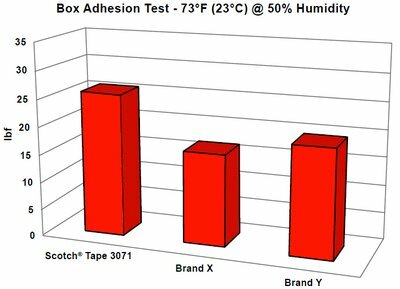 Scotch® Recycled Corrugate Box Sealing Tape 3071 utilizes a soft, synthetic rubber adhesive that offers good shear strength. This adhesive is able to penetrate the short fibers on recycled corrugate, flowing into the hills and valleys of the substrate surface to provide a strong seal. Scotch® Recycled Corrugate Box Sealing Tape 3071 is uniquely formulated to stick to recycled, corrugated boxes as well as provide excellent strength and durability. Our Scotch® Recycled Corrugate Box Sealing Tape 3071 has a conformable, biaxially-oriented polypropylene film backing that is tough, resistant and resilient, keeping boxes secure from production line to delivery. With environmental standards rapidly changing, companies are constantly seeking new ways to reduce costs and improve their environmental footprint. For this reason, packaging materials are in a constant state of flux. Our recycled corrugated box sealing tapes are designed to help you stay on top of these changes. Scotch® Recycled Corrugate Box Sealing Tape 3071 rolls can be easily applied by hand, manual dispenser or 3M-Matic™ Case Sealer with a roll-to-roll consistency that increases productivity and improves unit costs. Our Scotch® Recycled Corrugate Box Sealing Tape 3071 contains no solvents, heavy metals, latex, known allergens or melamine and is FDA approved for indirect food contact per CFR 21, Parts 174-176. Exceptionally strong, Scotch® Recycled Corrugate Box Sealing Tape 3071 provides a secure and durable closure, making manufacturers' jobs easier. The advantages of Scotch tapes give you the means to keep pace with industry changes. Enjoy the benefits that come with a product designed to satisfy the demands of today's challenging packaging applications.